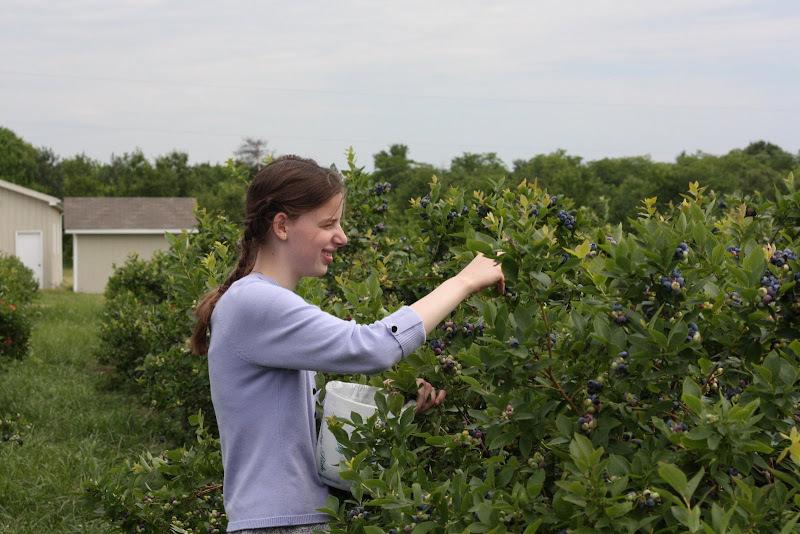 I think summer must truly be here... we went berry picking yesterday! Here in the midwest, blueberries are just beginning to ripen. They are one of my favorite fruits to pick and preserve. 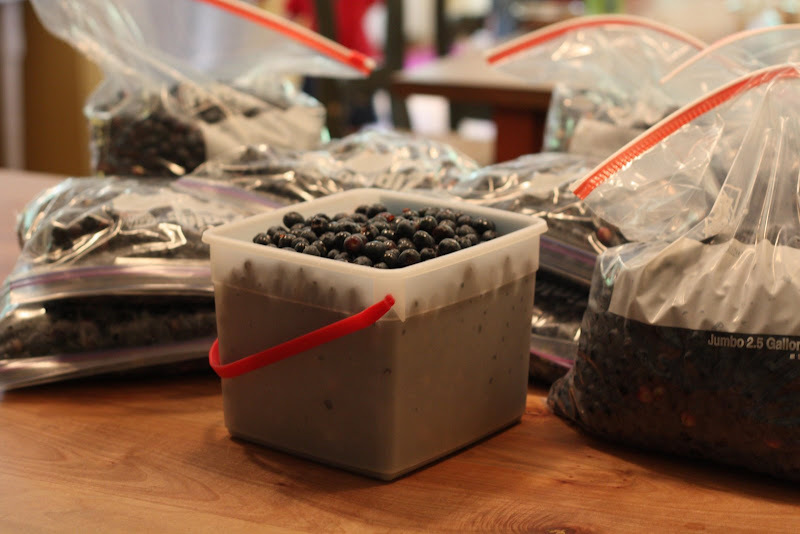 The berries are on tall bushes that are easy to pick, standing or sitting, and once we have brought them home, all we have to do is put the blue beauties in freezer bags and drop in the freezer! They don't even need to be washed first. If you do wash first, you will have a frozen lump of berries in the freezer! You don't want that, now do you? When ready to use, simply scoop out the frozen "marbles" and rinse in a strainer. mmmmm... Did I tell you that these are good? My hard-working helpers and I picked 66lbs of berries in about an hour and a half! I love having the fruit to pull out of the freezer, but what I really delight in is seeing my children working diligently together and enjoying each other in the process. This past week has been a challenging one for me. My hard-working husband has been, well, working hard with little time off recently. I have found myself addressing some character issues with the children~ over and over recently. Quite honestly, I can grow weary at times. What is a discouraged momma to do? 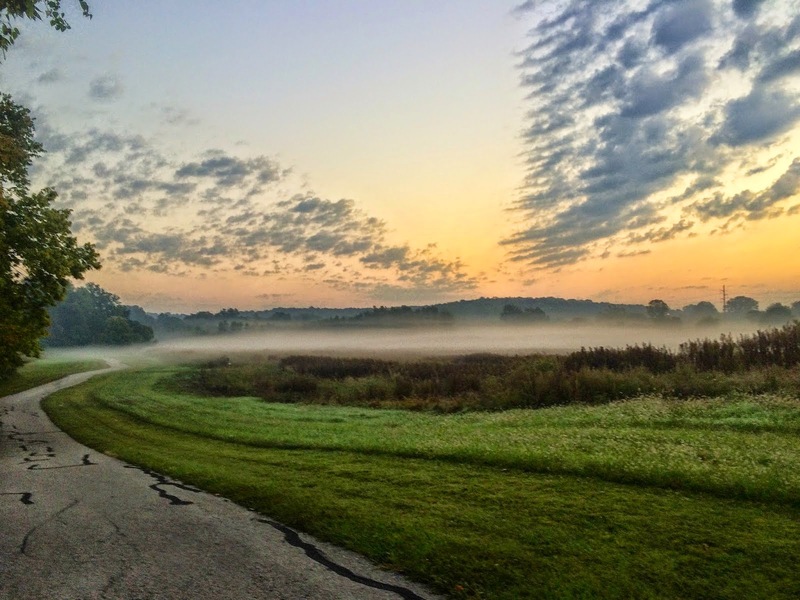 I find myself grabbing my Bible, searching for wisdom and encouragement there, not only in my early morning quiet time, but throughout the day. Oh! The Lord is so faithful to meet me there, in my weakness. So it is good. Good for me to have imperfect children being raised by an imperfect mother. I find myself humbled and drawn to Him in ways that I never would be otherwise. Being a mother to so many has taken me way past what I can do "on my own," and driven me on my knees to Him. Hi there Heather! I emailed you, but thought I'd post here as well. I'm not sure about Lebanon, but in this area, it seems that the most prolific blueberry patches are on the south side of the city. Blueberries need an acidic soil. If your soil isn't acidic enough, it is possible to amend it. One way is by adding significant amounts of peat moss to the hole where you plant them. In reference to water, most large patches do have soaker hoses that run down the rows of bushes to make watering easier. Summer here in MO can get quite dry at times. The berry bushes do best with a reliable source of water~ especially when they are young. 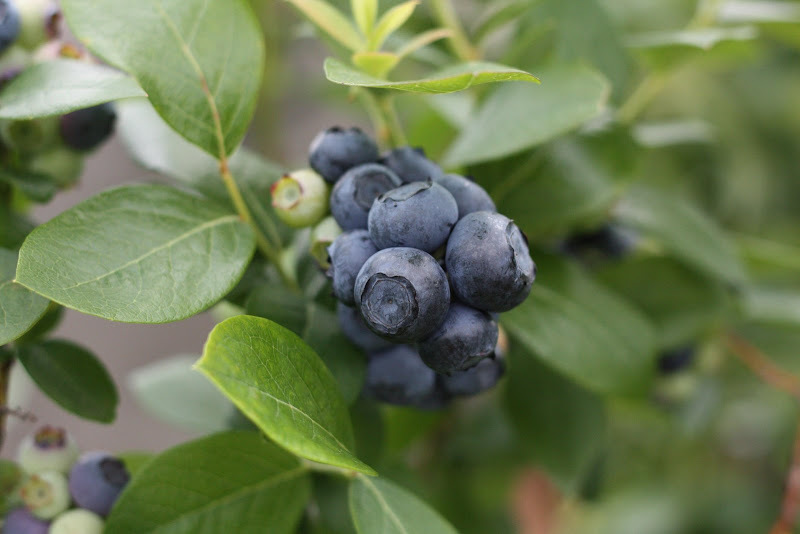 You will get some (a very few) blueberries on two year old plants, but they will be several years old before they produce a significant quantity of berries. My experience is that there is a great market for blueberries... the patches that I know of locally sell out each year, no problem. Around here the price ranges from $1.80/lb (where we pick~ friends of our family) to as much as $3/lb. 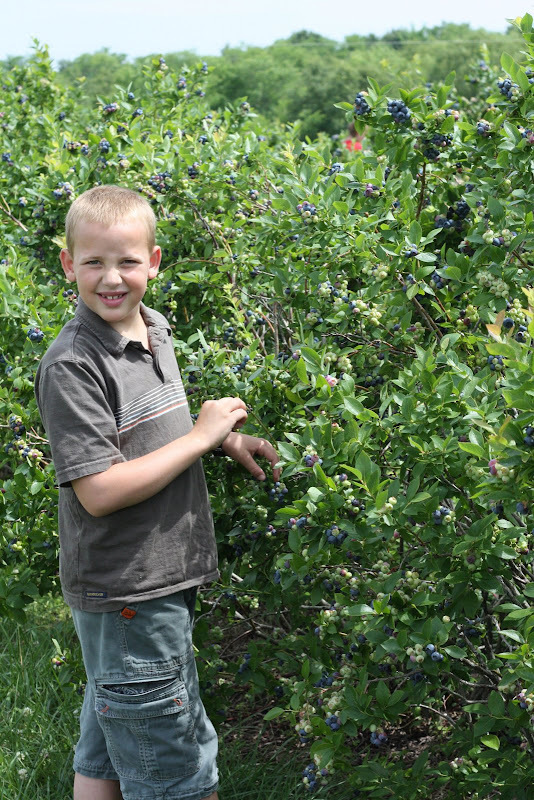 If you purchase blueberry bushes, be sure to check and purchase varieties that do well in your area. 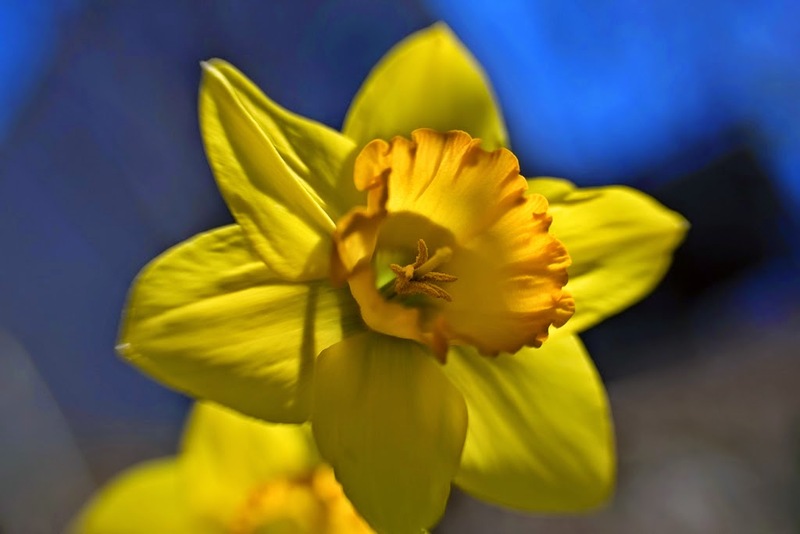 You could check with your local county extension office or a local master gardener. They should be able to tell you which varieties to purchase. LOVE your heart--Love learning from moms like you! Great post! Your pictures are great. 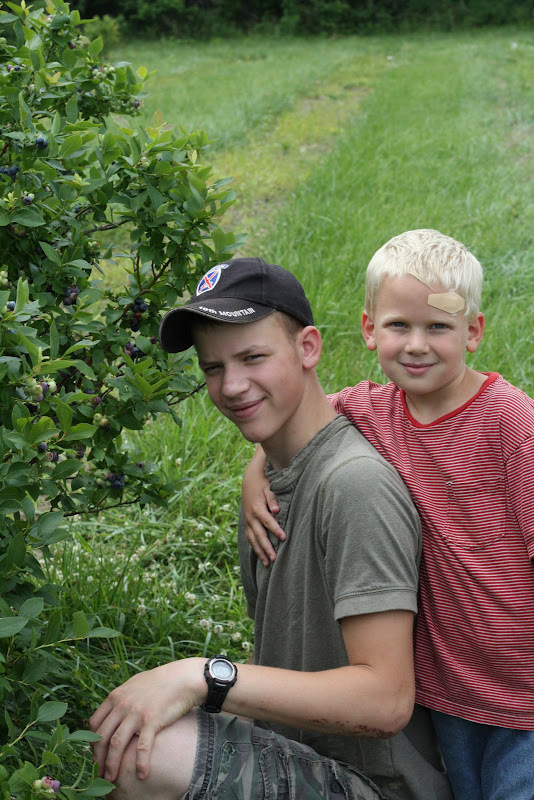 Our blueberry bushes are loaded with berries, but they won't ripen around here until July. I hope to have a lot to freeze this year plus enough to use fresh. Ohh, your beautiful pictures are making me hungry! I can't wait to go blueberry picking! We have a great place here in Texas and we look forward to it! They should be ready in another week or two. I love the pictures on your blog! I love your encouraging words and cheerful smile. God has been blessing us this past couple of weeks, but I have been away from the computer. It is good to be back! Yumm. Yumm. Ours will soon be ripe. But...we don't get too many...we compete against the birds too much with our Blueberry bushes. 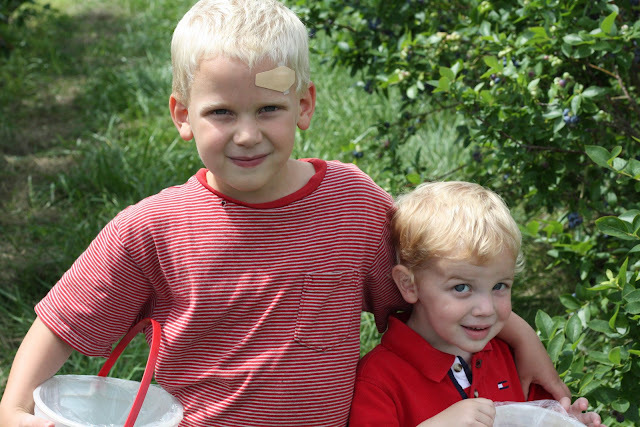 So, what we really like to do is head into the woods and go Huckleberry picking in August. Beautiful pictures and beautiful post! I'm curious what you do with your frozen blueberries? blueberry muffins, blueberry pancakes -- what else? I think we consumed most of them simply by using them for breakfast with yogurt and granola~ my very favorite way to eat them! To use frozen blueberries, all you need to do is rinse them in a strainer first. We also have some favorite recipes for blueberry muffins, a super-good pineapple (and blueberry when I have them) coffee cake, and even a dessert called "Blueberry funny cake." Perhaps I can post some of those recipes in the future.